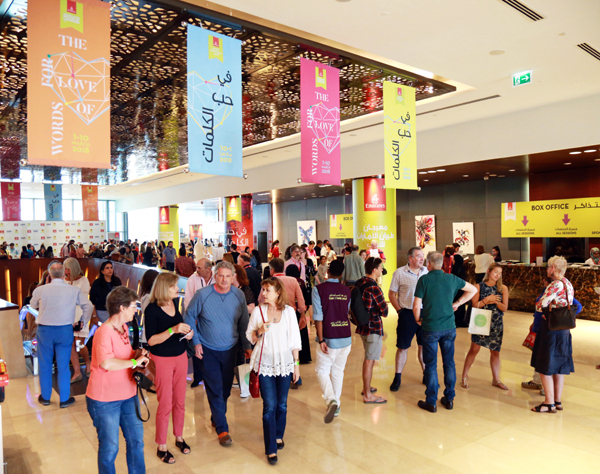 10th Emirates Airline Festival of Literature Ends with a Bang! – Emirates Airline Festival of Literature. 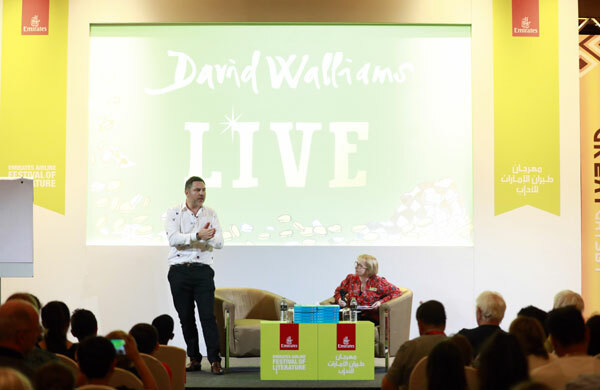 Dubai, 10 March, 2018: Following ten days of literary celebrations, the 10th Emirates Airline Festival of Literature concluded on a high with a sold-out session with renowned comedian and bestselling children’s author David Walliams. The event capped off the Festival’s most successful edition, which featured 180 authors from nearly 50 countries. Held by the Emirates Literature Foundation, the Festival is under the patronage of His Highness Sheikh Mohammed Bin Rashid Al Maktoum, the Vice-President and Prime Minister of the UAE and Ruler of Dubai. Isobel Abulhoul, OBE, CEO and Trustee of the Emirates Literature Foundation and Director of the Emirates Airline Festival of Literature said, ‘I am thrilled to announce that our tenth anniversary has been a resounding success. It has been such an honour to host renowned and beloved authors from around the world, to witness young readers delight in meeting their literary heroes, and see the power of words enlighten minds. Friendships have been forged and souls have been enriched. This is what the Festival is about – making memories that will last a lifetime. To commemorate the Festival’s decade-long literary endeavours, organisers launched a limited edition book, For the Love of Words, which featured a collection of essays, poems, short stories and illustrations by authors, speakers, illustrators and poets who have attended the event over the years. The book was launched at the Opening Ceremony, a lavish extravaganza engaging all the senses – from recitals by international and regional authors, to shadow dancers and performances by traditional Emirati sea-faring singers – the ceremony was a larger-than-life remembrance of the Festival’s journey so far. In line with the resurgence of poetry around the globe, the Festival debuted an extraordinary poetry evening at the Dubai Opera. For the Love of Words, presented by the Emirates Airline Festival of Literature, Dubai Opera, the Ministry of Tolerance and the British Council, with the support of the UK GREAT campaign formed part of the UK/UAE 2017 Year of Creative Collaboration closing celebrations, gathering the best of the UK and UAE’s contemporary poets under one roof. Khalid AlBudoor, Nujoom Nasser AlGhanem, spoken word artist Afra Atiq, UK Poet Laureate Carol Ann Duffy, Simon Armitage, John Agard, Imtiaz Dharker, Hussain Lootah, Roger McGough, Grace Nichols, Lemn Sissay and World Poetry Slam Champion Harry Baker enchanted a packed theatre of poetry performance enthusiasts. The 2018 Festival included a host of powerful panel sessions that showcased the Festival’s diversity of genres. Highlight sessions included discussions on writing great female characters, Arabic science-fiction, the hidden secrets of the Arabian Nights stories, displacement and writing in exile, as well as the annual International Women’s Day session, which, this year, focused on the theme ‘Press for Progress’. The Festival programme also included a dedicated Publishing Day, where global industry experts held sessions, masterclasses and workshops on key aspects of publishing, challenges of publishing children’s books and the evolution of the Arab World publishing industry. To highlight the importance of inculcating a love of words in the next generation, Festival organisers, in association with the Department of Tourism and Commerce Marketing (DTCM), introduced the three-day International Students Programme. University students from the Arab World were treated to three days of inspiring and diverse sessions specifically designed to implement the Festival’s goal of cross-cultural exchange. Registered students had the opportunity to interact with and attend sessions by the crème de la crème of the Festival’s author line-up. This year also saw a record increase in the number of students participating in the Festival’s children’s competitions, the Taaleem Award for poetry writing, the Oxford University Press Story Writing Competition, Chevron Readers’ Cup and Emirates NBD Poetry for All Competition for poetry performance. Particularly moving were the performances by students of determination, participating in the new non-competitive category of the Emirates NBD Poetry for All Competition. In addition, more than 28,000 students from around the GCC took part in the Festival this year, enjoying the unique opportunity to interact with and hear from a top international author, either at the Festival or at their schools and universities. The title sponsor Emirates Airline, in partnership with Dubai Culture & Arts Authority (Dubai Culture), the Emirates dedicated entity for culture, arts and heritage, make the Festival possible, and the InterContinental, Dubai Festival City, hosts the Festival events and authors. Organisers of the Festival extend their thanks to the many other organisations that also play an important role as supporters and sponsors of the event. More information about the Emirates Airline Festival of Literature can be found online. Fans can keep up to date with #DubaiLitFest action on Facebook, Twitter, Instagram and YouTube and year-round news of #ELFDubai on Facebook, Twitter, Instagram and Snapchat.